Click to viewAfter decades of popsicle promotions that included prizes printed on the stick, Brazilian ice-cream company Kibon has taken it to a new level by including the actual prize inside the popsicle: they will manufacture 10,000 specially made propsicles, identical in size and color to the actual thing, frozen with iPod shuffles inside. We talked to Mentor Muniz Neto—creative director for Bullet Brazil, the company who got the idea—about how they worked with Apple to achieve this. Bullet Brazil is the company that developed the idea for Unilever's Kibon, which is the Brazilian equivalent of the Good Humor ice cream brand. They started to think about it back in March with the objective of putting the shuffles directly in the hands of the prize-winner. 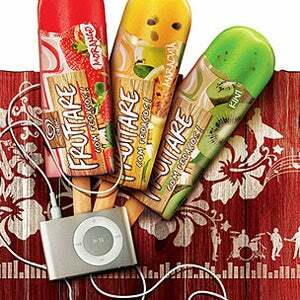 "It works like this: the consumer buys an Fruttare popsicle which comes in 10 different fruit flavors," Neto told us, "and may find an iPod Shuffle inside the package," ready to play. However, since people would be able to tell that an iPod is inside by looking at the package itself, they had to find an alternative. The popsicles with prize inside had to be exactly the same as the regular popsicles. The obvious solution was putting the shuffles inside a real popsicle, but this was ruled out as the humidity would have destroyed the shuffle in no time, even with plastic around it. The other idea: a fake ice cream that looked exactly like the real thing. "We developed a special prototype that emulates the real ice cream;" Neto says, "it protects the iPod from humidity, and it feels like the real ice cream. It is virtually impossible to fell the difference without opening the package." Their testing proved successful. Apple was not convinced about it, however. As we know, Cupertino is extremely concerned about their image and they couldn't afford faulty iPods falling into the hands of consumers. Even if the propsicle could protect the iPod against humidity, Infinite Loop still had to check if the special fake ice cream could protect the electronic circuitry against temperatures between -4 and -22 degrees Fahrenheit (-20 and -30 degrees Celsius), which is the normal temperature range of a standard freezer. After a never-ending number of tests, they saw it worked and Apple gave the go-ahead from California. With the iPod ready to go, the only question left was how to get the charger and the manual. They solved it by providing a 800 number and a code to the winners. And the final touch: they will get a real popsicle in the package, same flavor as the fake one.